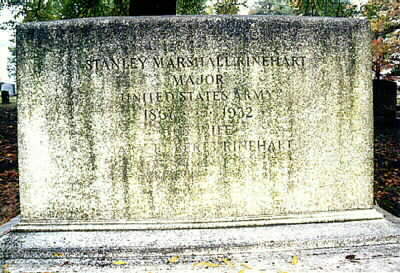 A world-aclaimed writer, playwrite and war correspondent, she was the wife of Major Stanley M. Rinehart, United States Army Medical Corps. She died in 1958 at the age of 82 and was buried with her husband in Section 3 of Arlington National Cemetery. Mary Rinehart was born in Pittsburg, Pennsylvania on August 12, 1876 in a small house on Arch Street. Growing up Mary had a financially difficult childhood as her father was an impractical, frustrated inventor, always in pursuit of fortune and never finding it. His most practical invention was a rotary shuttle for sewing machines. Mary attended Allegheny High School and developed a love of literature there. She wrote several short stories for the Pittsburgh newspaper and received a dollar for each story. However, she did not write again for many years. Mary Roberts Rinehart's first book "The Circular StairCase" was published in 1908. It was this novel that proved to the world that mystery, crime, and humor can be combined successfully. This literary work brought her world wide acclaim and began her professional career. She developed the phrase, "the butler did it" which is still used today. Throughout her career Mary Roberts wrote more than fifty books, eight plays, hundreds of short stories, poems, travelogues and special articles. Mary Roberts Rinehart is remembered as a world famous writer, playwright and war correspondent. She is remembered in the literary world for her accomplished writings about murder mystery. 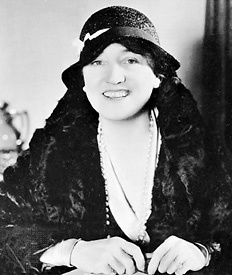 Rinehart, Mary Roberts , 1876–1958, American novelist, b. Pittsburgh. A graduate nurse, she married Dr. Stanley M. Rinehart in 1896. The first of her many mystery stories, The Circular Staircase (1908), established her as a leading writer of the genre; Rinehart and Avery Hopwood successfully dramatized the novel as The Bat (1920). Her other mystery novels include The Man in Lower Ten (1909), The Case of Jennie Brice (1914), The Red Lamp (1925), The Door (1930), The Yellow Room (1945), and The Swimming Pool (1952). Stories about “Tish,” a self-reliant spinster, first appeared in the Saturday Evening Post and were collected into The Best of Tish (1955).